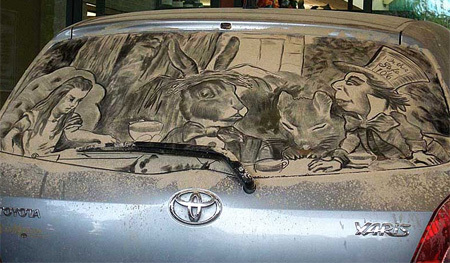 Scott Wade creates memorable art by drawing on rear windows of dusty cars. A lot of them seem to be on the same car, and they all seem to be the same kind of dirty which probably means he dirties them himself. 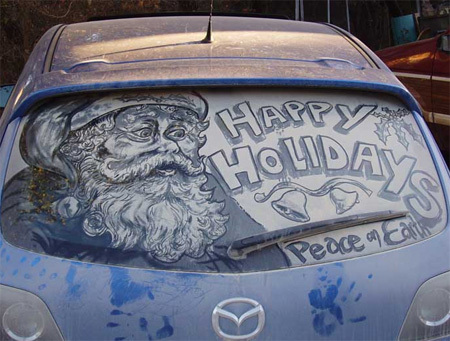 It would be a lot more interesting to me if he just went out and found dirty cars to do this on. Imagine coming back to your car and finding that on the back window. … Well yeah. If you watch the video, he does exactly that. 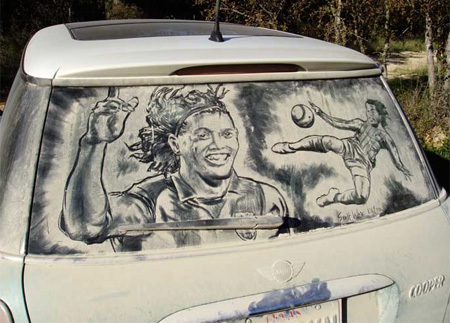 He cleans the car, then uses a blow dryer to get fake dirt on the window. 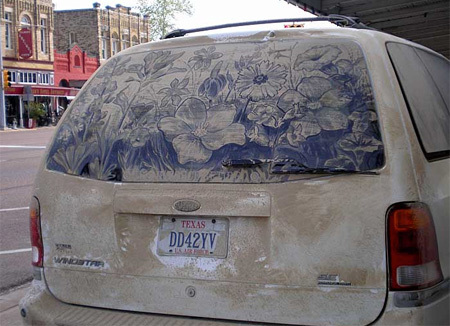 Honestly though, do you think there would be cars with windows that dirty that you could just find anywhere? 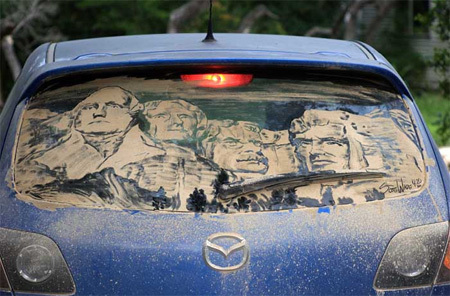 I agree, this would be way cooler if he just drew on random cars. 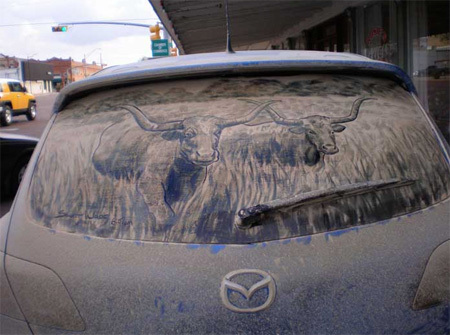 Of course people would be like WTF if they came while he was still doing it… And @Truthiness, trust me, you can definitely find cars that dirty in Texas. Very cool. But, yeah… would be even cooler if he did it to random dirty cars. 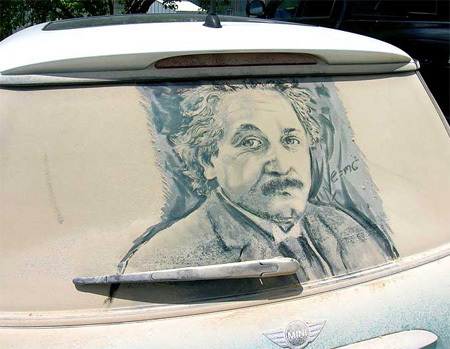 @ Truthiness yes, you can find dirty cars like that. Come in Portugal in summer time and you’ll see. Very nice ,but I agree with the others, random cars would be cooler. You people are unbelievable! The man makes a masterpiece in dust, and you want it to be random dust? Go back to the basement and hush. Really inspiring, shows you can make something fantastic in the most unexpected places with the most under rated mediums. Very nice work but hard to see behind you!!! Ha! 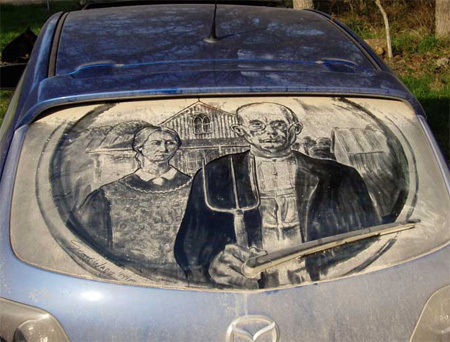 Taken writing “Please Wash Me” in the dust to a whole new level. Brilliant! I must say… If I found you doing that to my car I would clobber you one. Everyone knows that if you touch the dust on your car’s paint it scratches it. In the end you sit with a lot of hair fine scratches visible when you look at it in the sun. The same goes for the windows. That is why you always rinse a car with a hose before you wash. The art though is out of this world! All of the haters need to get over themselves. This is great art and to think it didn’t evolve from a more natural form is just ignorant. Watch the video of him in action before rushing to judgement. To the artist I’d like say that I love the art itself, but I was about to also throw my 5 cents worth in about a concern, when I read driftingmode’s comment. Since it basically addresses my thoughts I will just say this: I think the artist should give us his thoughts on what driftingmode wrote above. To junglist I want to say that the artist can defend himself. I can skin a deer in 7 different ways… Some of them in my opinion look pretty arty afterwards… Even thought provoking. But the fact remains I slaughtered a living thing and it will provoke anger and dismay in most. Is it art – NO! Someone scratching my car is also not art. I used to live in the same town as Mr Wade.. I’ve personally seen his Mazda 6 at the local library with art on it. Of course it makes more sense the artist would use his own medium; people who use public and/or other privately owned property are usually called out for their ‘vandalism.’ And knowing the kind of desert-y dusty caliche that coats every inch of that area in Texas, I can vouch for it’s authenticity. Also, drawing on the window will not scratch the paint. I really like this idea, I love to play with mediums a lot, everything from tattoo (forever) to dust art which can be gone the next morning. I love seeing people do things differently. My question for the artist (if he has the time to respond) is what do you use to prep the window for the dust? I have tried water and have had no luck being that it spots and dries too fast. I am looking forward to doing something different on my own car often, I think it would be cool to drive around with a unique piece of art on my back window. :-). Thank you Scott for your inspiration and I love seeing your creations.